A true fashionista knows that the saree is one of the most elegant outfits available. Yes, you’ve heard right! There are many reasons why the saree has always been preferred at weddings or functions. It is because Indian women look best in this attire as it has been made for them. At the same time, there is a treasure trove of styles that one can select from. For these reasons this traditional garment has always been popular, even today. 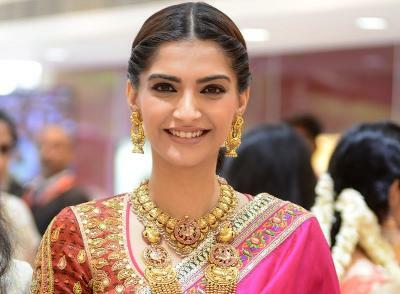 And Sonam Kapoor was recently seen at the Kalyan Jewelers store in Chennai in a beautiful saree. Let’s take a closer look at what she wore and take a leaf out of her book. Happy reading! 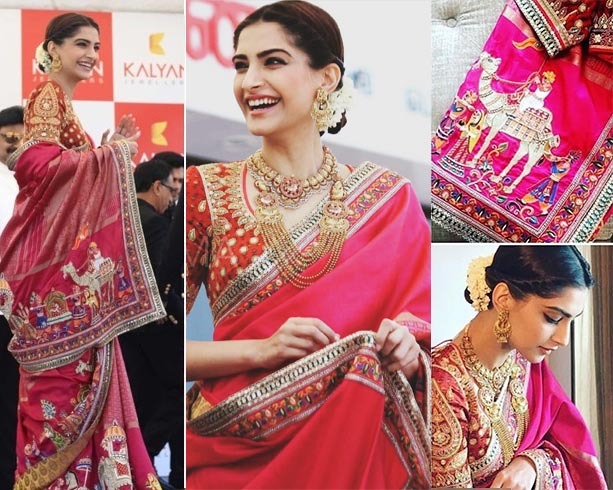 Sonam wore a beautifully crafted hot pink Abu Jani Sandeep Khosla creation. The block prints made the saree look grand, fitting the occasion. Her blouse had heavy embellishments adding to the grandeur of the outfit making her look enchanting. As for her accessories, you needn’t think twice! The celebrity wore statement Kalyan Jewelers pieces that went well with her outfit. The chand baalis and the neckpiece were nothing less than beautiful. Sonam nailed the vintage look with her bun and gajra along with the right amount of makeup. We loved her look, did you? Don’t forget to share your thoughts in the comments section. If you loved this article, don’t forget to share it with your friends. Do subscribe to our website for the latest style updates. Thank you!